AMONG the final acts before Bhagavan's departure the first one was the Kumbhabhishekam (consecration) of Matrubhuteswar shrine. Commenced in 1939, the shrine was very small with just the samadhi and a linga thereon covered by a thatched roof. This was not satisfactory to many and devotees wished to build a marble shrine in its place. But money, people's cooperation and above all God's will are essential for anything. felt that the temple being built in a graveyard would be very powerful and welcomed the proposal as an act of piety towards one who gave birth to Bhagavan, there were a few who questioned the need and propriety of a temple in "modern times." Anyway, cooperation of several people was forthcoming in an abundant measure; money and material poured in. The images worshipped at the temple are those of Matrubhuteswara (i.e. Easwara who came as Mother) Yogamba, Sri Chakra engraved on a stone at the bottom of which is fixed another Sri Chakra made of gold. The entire construction took place according to the agama sastras under the supervision of a sculptor who was brought from the South. A separate hall to seat Bhagavan was also constructed just in front of the temple. This was because the old hall where Bhagavan sat was getting overcrowded with visitors. In 1946, the Golden Jubilee of Bhagavan's advent at Tiruvannamalai was celebrated grandly. To accommodate the visitors a `Jubilee Hall' with a thatched roof was erected. Even after the celebrations were over, Bhagavan continued to sit there and grant darshan but it was uncomfortable both in the rainy season and hot summer. Niranjanananda Swami felt that a suitable large hall had to be constructed for Bhagavan's use. The place chosen for that was just in front of the temple for Mother. The foundation for the hall was laid on 25 January 1945 and the work commenced on 16 May 1946. It was completed along with the temple. A huge granite `throne' was also sculpted for Bhagavan to sit. By February 1949, all the jobs were almost completed and the consecration was fixed for 17 March 1949. In that context the lingam [?] etc. which were at another spot were brought and placed at the new place and abhishekam of the temple crest was performed according to the procedures prescribed in the sastras. All the rituals were carried out over a period of three days. The Puri Sankaracharya also participated in the function. Though a separate elevated seat was offered to him befitting his status he declined it and sat on the floor over a deer skin near Bhagavan. During his conversation with Bhagavan he asked for a clarification of a particular scriptural saying. After Bhagavan gave the reply, the Sankaracharya repeated that he could still not grasp the point. Thereupon Bhagavan looked at him bestowing his grace for about half an hour. The Sankaracharya shut his eyes and with tears flowing down he bent before Bhagavan and said that he had understood the subject. As the Sri Chakra was to be laid in the shrine and as he was an adept at it, the Sankaracharya himself volunteered to attend to the job. Bhagavan sat close by and blessed the proceedings. on the 17th morning. All through the time there was great enthusiasm and rejoicing. Those who observed Bhagavan during those days felt that he was bestowing his auspicious and supernatural powers on the Sri Chakra and others. His physical strength was at a low ebb but the work he embarked on was very arduous. It looked as if he was transferring all his powers to them. It may not be inappropriate to elaborate about the presiding deity here viz., the Meru Sri Chakra, which is about two feet square with adequate height. Sri Bhagavan spent the night at the spot when it was fixed. He sat there bearing the heat of the furnaces used to melt the metals so that they could be properly fixed. Bhagavan himself placed the gold Sri Chakra beneath the Meru. After the Kumbhabhishekam daily pooja was being carried out at the shrine. But as no special poojas were being performed at the Meru Chakra it was felt expedient to do this also. This commenced in 1953. Special poojas are performed on six occasions every month such as each Friday and full moon day ? They are quite an elaborate affair spread out over some hours. All the plans for poojas were finalized during Bhagavan's presence when an attendant remarked, "How nice it would be if these poojas were to be continued forever". Bhagavan assented and asked. "But who would take the trouble?" 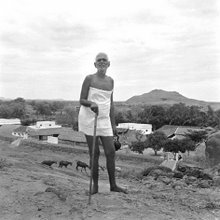 Sadhu Arunachala (Chadwick) came forward to take the trouble. Everything has since been going on quite regularly. It could be due to the influence of the poojas, that all the problems relating to the Ashram got slowly resolved. After 1945, Bhagavan did not take up any writing. Characteristics of a Siddha: In the Bhagavata there is a part called the Hamsageeta (Swan song) where the characteristics of a siddha [?] are described. During the course of a conversation in 1946 this piece was brought to Bhagavan's notice. He was gracious enough to give its substance in Tamil and later in Telugu. Trisulapura Mahatyam: In February 1946, Bhagavan asked Viswanatha Brahmachari to translate this Sanskrit work into Tamil which he later corrected. Trisulapura means Tiruchuzhi. Paratma Pooja: Adi Sankara wrote two pieces called Para Pooja and Atma Pooja. Bhagavan combined them and wrote Paratma Pooja. This contains the philosophy of pradakshina. There is a story relating to this in the South. It goes like this. Siva had a fruit in his hand which both Vinayaka and Guha wanted. Siva said that the fruit would be given to the one who circumambulated the lokas and came back first. Immediately Guha set out on his peacock whereas Vinayaka, the cleverer one, simply did a pradakshina of his parents and demanded the fruit. All the lokas were in Maheswara and so, a pradakshina of Maheswara amounted to the circumambulation of all the lokas! Performing circumambulation of Maheswara mentally would amount to Para Pooja. Conversation of Jnaneswara and Vittoba: Manu Subedar was very famous in Maharashtra. He translated into English a commentary on the Bhagavad Gita written in Marathi by Jnaneswar the saint. Manu Subedar once asked Bhagavan, "Almost all books are about siddhas but are there any about sadhakas?" Bhagavan replied: "In the Tamil work, Bhakta Vijayam there is the conversation between a siddha [?] and a sadhaka, that is the conversation between Vittoba and Jnaneswar." Later Bhagavan got this translated into English and sent it to Manu Subedar. A Telugu translation of this `Conversation' was done by Suri Nagamma. "The single letter shines forever of its own accord within the Heart. Who can hope to write it?". The day that Narayana grinds to death the naraka- ego in the quest of knowledge, inquiring whence the naraka-I rises to rule the naraka-world, that day is the light festival of Naraka-chaturdasi. To search and slay the sinner, the naraka-ego corrupted by thought that one is the naraka-form, the false body-tenement, and to shine as the true Self, this is Dipavali indeed. gesture known as chinmudra. The four seekers were drawn to him even as iron is drawn to a magnet. They sat before him absorbed like him in the Self. Even advanced spiritual aspirants cannot easily understand this state of silence. The world, the seer and the awareness which enables it to be cognized stand as obstacles in their way. But since it is the single power (Sakti) which manifests itself as these three and again withdraws them into itself, everything is that power which is the Self. Sankaracharya has expounded this truth in this hymn. During the Virupaksha days Bhagavan and Ganapati Muni were discussing the Hridaya (Heart) and Sahasrara. A devotee by name Arunachala who was sitting close by wrote the summary of the discussion in English. The same was translated into Tamil by Bhagavan. At the request of Suri Nagamma, Bhagavan translated into Telugu three songs on Tiruchuzhi originally written by him in Tamil. Panchakam in Telugu adopting the Tamil metre, venba. 1. When, forgetting the Self, one thinks That the body is oneself and goes Through innumerable births And in the end remembers and becomes The Self, know this is only like Awakening from a dream wherein One has wandered over all the world. 2. One ever is the Self. To ask oneself "Who and whereabouts am I?" Is like the drunken man's enquiring "Who am I?"? and "Where am I"? 3. The body is within the Self. And yet One thinks one is inside the inert body Like some spectator who supposes That the screen on which the film is thrown Is within the picture. 4. Does an ornament of gold exist Apart from the gold? Can the body exist Apart from the Self? The ignorant one thinks "I am the body", The enlightened one knows "I am the Self ". If of yore the First of Teachers Revealed it through unbroken silence Say who can reveal it in spoken words? Pancharatna and the poem about his birthday into Telugu. All these translations are in the venba metre not known to the Telugu language. "As one lets go the leaf after eating the food, the seer sheds his body." Sagar which became famous. It was translated both into Tamil and Telugu but as it was a voluminous work Arunachala Mudaliar asked Bhagavan to write an abridged version of the Tamil book which Bhagavan did. This book was published quite long ago but did not bear Bhagavan's name as the author. At the request of some Telugu devotees Bhagavan translated it into Telugu under the title Vichara Mani Mala.